The Shearwater Bridge is situated in Ocean Springs, Mississippi and spans the entrance to the "back harbor" of the Ocean Springs Inner Harbor. The small bridge is the division between General Pershing Avenue and Shearwater Drive. Although their is a harbor here today which was dredged out in the 1930s, this area is clearly portrayed on the 1850 Biloxi Bay Map created by the US Coast Survey, as a very small bayou. 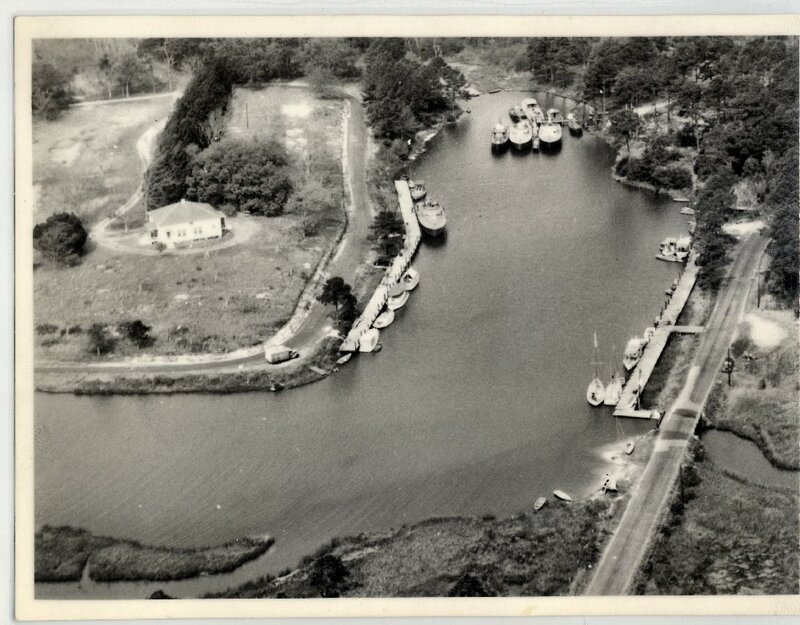 This has been corroborated by the author in interviews with Marguerite Seymour Norman (1908-2001) who remembers that the mouth of the small bayou, then called Mill Dam Bayou, was so small that it could be crossed at low tide by laying a large board across its mouth. In the 19th Century, Bayou Baiziene became know as the Mill Dam Bayou. Captain Ellis Handy (1891-1963) who in the late 1940s wrote a column "Know Your Neighbor" for The Gulf Coast Times, interviewed local historian, Joe Lewis "Dode" Schrieber (1873-1951). Mr. Schrieber related that the "Mill Dam" was created by William Gray Kendall (1812-1872), an entrepreneur from Kentucky, who erected a weir or small dam across the bayou to trap tidewater and provide a source of energy to grind corn or other grains at a mill located on that site. The grinding wheel fell into the mud and silt of the bayou when it was abandoned in the 1870s. (The Gulf Coast Times, August 26, 1949). Naturally, the road crossing the dam was called the Mill Dam Road. It became known as, Anola, probably for W.G. Kendall's daughter, Anola Philomela Kendall (1843-1899). We know this thoroughfare today as Shearwater Drive. Charles E. Schmidt, Ocean Springs French Beachhead, (Lewis Printing Services: Pascagoula, Mississippi-1972), p.
The Bay Press, “HOSA to sponsor additional costs of Shearwater Bridge”, April 2, 2002, p. 1. The Jackson County Times, “Rebuild bridge on the ‘Mill Dam’”, January 18, 1936, p. 3. The Jackson County Times, “Mill Dam Bridge nears completion”, January 25, 1936, p. 1. The Jackson County Times, “The Column”, February 1, 1936. The Mississippi Press, “Shearwater bridge design offered”, January 16, 2002. The Mississippi Press, “New Shearwater Bridge Under Construction”, May 30, 2003. The Ocean Springs News, “Let Contract on Shearwater Dr. Bridge Work”, January 16, 1958. 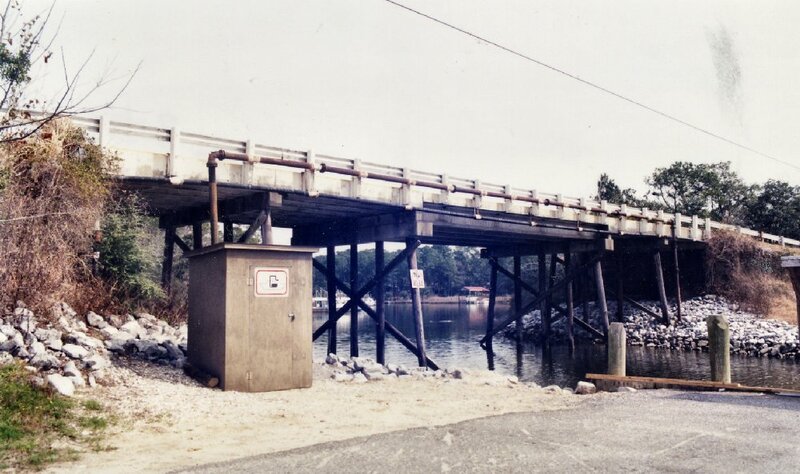 The Ocean Springs Record, “Majority wins debate over bridge on Shearwater”, November 1, 2001. The Ocean Springs Record, “Objections stall harbor bridge”, February 20, 2002. The Ocean Springs Record, “Bridge replacement hampered by delays", July 11, 2002, p. A1. The Ocean Springs Record, “Harbor Bridge held up”, January 23, 2003, P.A-1. The Ocean Springs Record, “Bridge hurdles gone”, May 15, 2003, P.A-1. 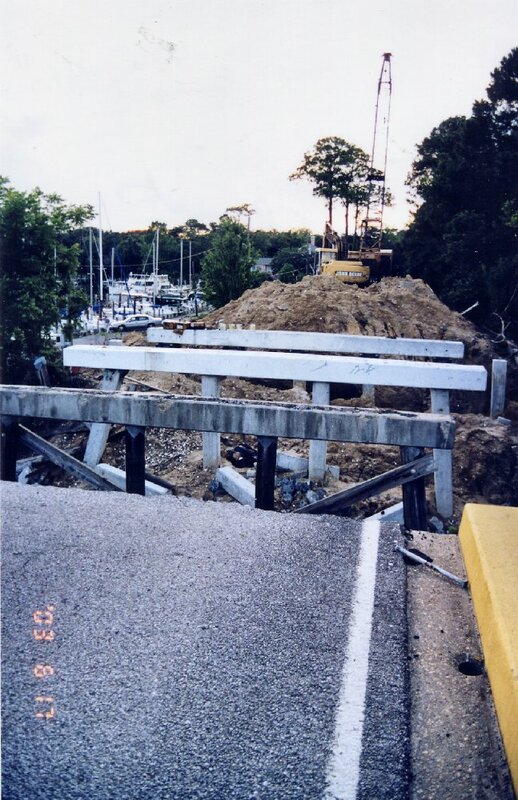 The Ocean Springs Record, “Bridges may be open in 90 days”, June 26, 2003. The Ocean Springs Record, “Bridges may be fixed in 60 days", July 24, 2003, p. A1. The Ocean Springs Record, “City pays bill despite bridge flaws, July 24, 2003, p. A1. The Ocean Springs Record, “Shearwater Dedication”, April 22, 2004. The Ocean Springs Record, “Shearwater Bridge improved as part of Corps' Coastal Improvement Program", March 26, 2009. The Sun Herald, “Shearwater Bridge plans get new flair”, January 16, 2002. The Sun Herald, “Bridge redo delayed", March 3, 2003, p. A2. The Sun Herald, “Ocean Springs gets permit for Shearwater Bridge”, May 3, 2003. The Sun Herald, “Shearwater Bridge to open in two weeks", September 16, 2003, p. A3.